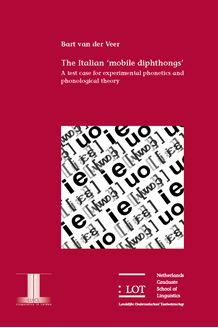 The Italian ‘mobile diphthongs’ sheds light on the complexity of one of the salient analogical changes that occurred in the Italian language, viz. the elimination of the alternation between the stressed diphthongs [je] and [w.] and the unstressed monophthongs [e] and [o], respectively, within a limited group of inflectional and derivational paradigms. Historically, the mono­phthong–diphthong alternation was the consequence of a pan-Romance diph­thongization process that affected the Late Latin low mid vowels in stressed positions. The relatively recent levelling of this alternation has led to a great deal of variation: in some cases the alternations are maintained while in others they have been eliminated. The first aim of the present study was to scrutinize durational aspects of Italian diphthongs and monophthongs in general. The second aim was to examine to what extent the variation caused by analogical levelling of the monophthong­diphthong alternation, attested in written sources, also occurs in the spoken language. To investigate these issues, a series of production experiments was carried out with native speakers of Italian. The final aim was to provide a coherent phonological treatment of the insights provided by the experiments within the framework of Optimality Theory. The book is intended as a contribution to experimental phonetics and phono­logy. It introduces an exciting tool for language-variation research, the speech­shadowing technique, and discusses recent phonological approaches to phe­nomena such as glide formation, analogy and paradigm uniformity. Therefore, this study is of interest to both phoneticians and phonologists, as well as to linguists with a special interest in Italian.